A team led by Wenge Yang (HPSynC) and including researchers from Carnegie, the Advanced Photon Source, and University College London has made a major breakthrough in measuring the structure of nanomaterials under pressures. For the first time, a way to get around the severe distortions of high-energy X-ray beams that are used to image structures was developed. The technique could lead to new nanomaterials created under pressure and a greater understanding of material deformation inside planets. The group found that by averaging the diffraction patterns of the same crystal using different sample alignments in the instrumentation, and by using an algorithm developed by researchers at the London Centre for Nanotechnology, they can compensate for the distortion and improve spatial resolution by two orders of magnitude. 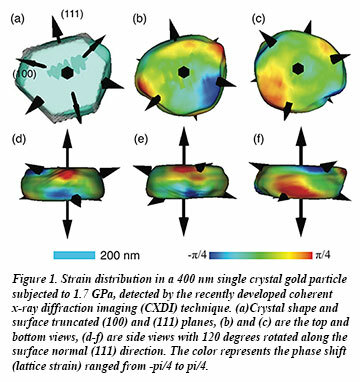 The researchers used the technique to study a gold nanocrystal, subjecting a 400 nm single crystal of gold to pressures from about 800 MPa to 6.4 GPa. The team conducted the imaging experiment at the Advanced Photon Source (beamline 34-ID-C). They compressed the gold nanocrystal and found at first, as expected, that the edges of the crystal become sharp and strained. To their surprise, the strains disappeared upon further compression. The crystal developed a more rounded shape at the highest pressure, implying an unusual plastic-like flow. According to Yang, nanogold particles are very useful materials as they are about 60% stiffer compared with other micron–sized particles and could prove pivotal for constructing improved molecular electrodes, nanoscale coatings, and other advanced engineering materials. The new technique will be critical for advances in these areas [W. Yang, et al., Nature Comm. 4, 1680 (2013)].